Northwest Arkansas is home to a variety of museums including its crowning jewel, Crystal Bridges Museum of American Art. Whether you are interested in world-class American art, country doctors, or Civil War history, you’ll find a museum that will suit your interest below. 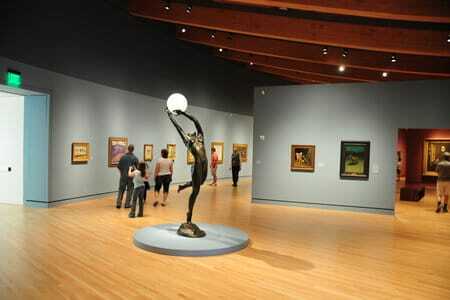 Crystal Bridges is a world-class museum of American art that combines the power of art with the beauty of nature. The museum is actively involved in collecting, exhibiting, interpreting, and preserving outstanding works of American art spanning five centuries. Many famous works including Rosie The Riveter by Norman Rockwell and Kindred Spirits by Asher B Durand can be observed in the free-to-view permanent collection. Even if you are not into art, you will enjoy the stunning natural setting and the beautiful trails that surround the museum complex. Walk through America’s past as you visit the exhibits in the museum and gift shop. Divided into five different time periods including the Paleo, Archaic, Woodland, Mississippian, Historic and the Pre Columbian, there are relics from every time period. On display are relics dating back from over 14,000 years old to historic times. Great for the family and educational for the kids. The Scott Family Amazeum, a hands-on museum for children and families. The dream of the Amazeum founders is to educate and engage the entire family in exploration, learning and fun to help prepare people for lies ahead. The Peel Mansion, built in 1875 as well as the gardens are a living display of that time period. Furnished with authentic artifacts and antiquities on loan from the Old State House and the Historic Arkansas Museum, it is a landmark of that era. It welcomes people to enjoy a look at historic Bentonville. Located on the Downtown Square in Bentonville, the museum is in three parts, a museum, a working 5&10, and the The Spark Cafe. Trace the origin and growth of Walmart, the worlds leading big box giant. Experience the working 5&10. Enjoy interactives for all ages. Visit The Spark Cafe where the entire family can enjoy a delicious ice cream treat for under $5.00. The fascinating museum was the former private home and clinic of three country doctors who lived in the space from 1926 to 1978. There is only one other country doctor museum in the United States. Exhibits include an antique horse buggy, medical instruments, a vintage car, and memorabilia. Housed in an all-wood hanger that is almost as famous as the aircraft, exhibits and memorabilia it contains, the museum tells the colorful story of Arkansas aviation. It also display aircraft ranging from the golden age of aviation to the jet age, including Vietnam-era Army helicopters and a Navy carrier fighter. The first home of the 42nd president of the U.S. offers a photographic and memorabilia peek into the Clinton’s life when they were proud residents of Fayetteville. You will also see campaign materials from his run for office. During the Civil War this home was the headquarters for both the Union and Confederate armies. Today it is the headquarters for the Washington County Historical Society. Arrange for a tour of the home by calling 479-521-2970. This is a small museum with lots of history of the area. It is a super way to educate your kids about how things were done during the time of the city’s beginning,and up to and including the present. There are fun hands on stations for the kids to learn and enjoy themselves. Great family educational fun. Staff is patient and friendly. Museum and visitor center located on the grounds of the Battle of Prairie Grove State Park. Bring the history to life using interactive exhibits that interpret and detail the Battle of Prairie Grove. Learn stories about the battle, understand what part the landscape had to play, and hear about the devastating aftermath of the war on the local community. Drive through the battle field, or walk the hallowed ground where more than 2700 men were killed. Visit their live animals. Bring your camera and take pictures as you see and tough a variety of live reptiles. See a very large Boa Constrictor, some little milk snakes or even a giant tree frog. A reptile lover’s paradise. The museum tells the history of NWA. It got its name from the pioneer community of Shiloh, which later became Springdale. The museum facilitates a research library, which houses a collection of over 500 thousand pictures. Also on the grounds are six buildings that highlight the lives of ordinary people who lived in the rural communities of the Ozarks. Additionally, there are also many permanent exhibits portraying the lives of these everyday NWA people.